#225: Give Me Your Poor | mark Joseph "young"
This is mark Joseph “young” blog entry #225, on the subject of Give Me Your Poor. 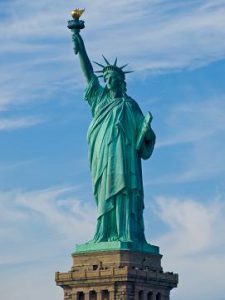 I recently saw a political joke in which someone was editing the famous plaque inside the Statue of Liberty in New York harbor (technically in New Jersey, but appearing as part of the New York City skyline). It makes a point about immigration policy, and was a clever idea when I first saw it–about half a century ago. The obvious point of the joke is that we have hardened ourselves against immigrants, people seeking a better life in what was not so long ago still called “The Land of Opportunity”. We were once an altruistic country with arms open to all, but now we want to keep out the refuse, the refugees, the unskilled labor seeking to escape a bitter life to a better one. I am not going to argue that we were not once more altruistic and have become less so. However, our open arms to immigrants in the past were perhaps not so altruistic an attitude as we in hindsight perceive it. We were a burgeoning economic power with seemingly unlimited land and capital, resources untapped and seemingly inexhaustible. In such a setting, labor is in demand, and bringing unskilled workers willing to fill bottom-tier jobs was good for business. It was also good for workers, because those who worked hard and learned skills could move up the ladder into the new openings constantly appearing in the expanding business and industry climate, as long as there were new unskilled workers to fill the bottom rungs. In Europe, where every square foot of ground belonged to someone, there was no room for advancement, and if you could get an entry level job you hoped only that you could keep it. Immigration was good for the American economy; our altruism was to some degree an illusion, like the love of the girl who is willing to marry the nerd who incidentally can make her happy with his fortune. The situation has changed. It has not changed abruptly; the fact that the same joke about government rewriting the invitation to prefer skilled and educated workers was around fifty years ago shows that there has long been a faction that would slow immigration and keep bottom-tier jobs available for unemployed Americans. What land remains unused is not so useful; resources are dwindling, and environmental concerns are making it more difficult to access them. We have been shifting to a service economy–a giant Ponzi scheme in which we pass money around without ever producing anything from our efforts. The immigrants who open a restaurant or operate a convenience store or gas station are now competing with low-level workers who have few openings on the rungs above, and the ladder itself is sinking as a college degree, once a guarantee of a good paying job with good benefits in a management or administrative position with room for advancement, is now what a high school diploma used to be, an edge in obtaining the bottom rung office, secretarial, warehouse, or factory jobs. This sounds like a good argument for tighter immigration policy. I am not going to make that argument. Rather, I would suggest that we who perceive our nation as good, altruistic, live up to the image we have of our ancestors. It was easy to be altruistic when the benefit obtained outweighed the cost; some would say that’s not altruism at all, but simple selfish capitalism. The question is, can we be altruistic when we have to pay the price? Can we open our arms to people in need, and say “I have food and shelter, and am willing to share it with those who have less”? Are we willing and able to do this on a national scale? I would like to think that we are those people, the people willing to surrender some of our wealth to help the poor. I would not promote full-bore generosity, completely open borders, partly because I am aware of two details about human nature–the one, that people will take advantage of kindness, and the other that people who feel they have given too much will react and retaliate. The average American thinks himself generous and kind, but has never been tested in that. The question is how much of our comfort we are willing to surrender to alleviate the suffering of others, and on the grand scale how much of our dwindling economic strength are we willing to share with people who come from poorer places. I do not ask that we open our doors to everyone; I do ask that we extend the grace for which we have been known in the past, to the extent that we are able to do so.